The first thumbs up: getting the Kulkea SP-Pro boot bag straps over two shoulders without taking the left jacket sleeve up the arm took some practice. Photo: Jill Griff. Three ski-related products & services came my way, gratis, this season. They arrived in such a way that I felt no obligation to write nice things about them or even write about them at all. But, after putting them to the test, all three are worthy of words and positive reviews. Early in the season Kulkea sent the Brave Ski Mom a Kulkea SP-Pro Boot bag. She and her family were set in the boot bag department, so she asked if I could use it. My size-13 feet require canoe-like ski boots, so many backpack-styled boot bags do not work for me. But Kulkea claims the SP-Pro is large enough to handle the 13’s so I decided to give it a try. I was familiar with the brand. My wife Jill (aka Ski Widow) is a fan of backpack-boot bags that hold the boots in side pockets with a compartment for a helmet and other accessories in the middle. She bought a Kulkea bag the season before and is very happy with it. The Kulkea SP-Pro is huge. It holds my gunboats in the side compartments with room to spare. The center section has plenty of room for a helmet and a change of clothes and another change of clothes. There’s a soft-material lined goggle pouch located within the pack and additional zippered compartments for gloves, hand warmers, face masks, balaclavas, and more. The Kulkea SP-Pro boot bag has a large strong handle which comes in handy when hanging up the bag. Photo: Martin Griff. I’ve never been a backpack type guy. I grew up at a time when backpacks weren’t the norm for school kids. As a newspaper photographer I carried my gear in a camera bag that went over one shoulder and over 35 years became an expert at balancing the thing. I used the same type of duffle bag for my ski boots. The good news is that this old dog learned a new trick and I figured out how to loosen and tighten the easily adjustable straps and discovered the buckles on the straps that allow for quick unbuckling. So now I’m loving everything about this boot bag… as long as I’m not flying anywhere to ski. The bag is too big for carry-on use and because it is made of soft shell fabric there is a chance that the helmet would be crushed when piled into an airplane’s baggage hold. When empty, the bag is easy to fold so I bring it along inside my suitcase for use at the destination. Way back in November I attended a fifth-year publication celebration for SeniorSkiing.com in New York City and won a raffle for an Orsden ski jacket. In addition to men’s and women’s jackets the company sells ski pants, tops and winter balm. Never heard of the brand? Neither had I. Using the online sizing chart, I determined that I was an XL and placed the order. The jacket arrived a few days later and was a little tight in the shoulders. I emailed customer service and got an immediate response from top bear Sara Segall. I don’t think I got a reply from the top because of my journalist / Not The Mama status. Sara had no idea who I was except that I was some guy that won a raffle. I believe Sara is on top of all aspects of the company. Orsden headquarters are in southern Vermont near Stratton Mountain Resort and upon my suggestion we agreed to make an exchange for a 2XL at Stratton’s base area. Not The Mama upped his fashion game with the addition of an Orsden jacket to his wardrobe. Photo: Jill Griff. During our brief exchange meeting we had a six-degrees-of-separation moment when I learned that Sara’s husband is a nephew of my long time friend, National Ski Patrol Historian and U.S. Ski and Snowboard Hall of Famer Gretchen Rous Besser. Between carrying skis on my shoulder and brushing up against tree branches (I’m tough on jackets), the Orsden four-way stretch waterproof outer material is holding up. It’s also breathable and releases water vapor from the inside out. Its fluffy insulation isn’t bulky, meaning the jacket works well in cold and kinda-cold weather. It’s also got more pockets than I’ve got stuff to put into them and high quality zippers without the over flap material that often gets stuff in the zipper mechanism on my other jackets. Like aunt Gretchen, the Orsden jacket is top notch and currently 50% off along with all apparel on their website. In January I joined the North American Snowsports Journalists Association at a meeting near Salt Lake City where we skied Snowbird , Brighton, Alta, and Solitude. Ski Butlers, a mobile ski, snowboard and boot rental company, supplied NASJA members with skis. 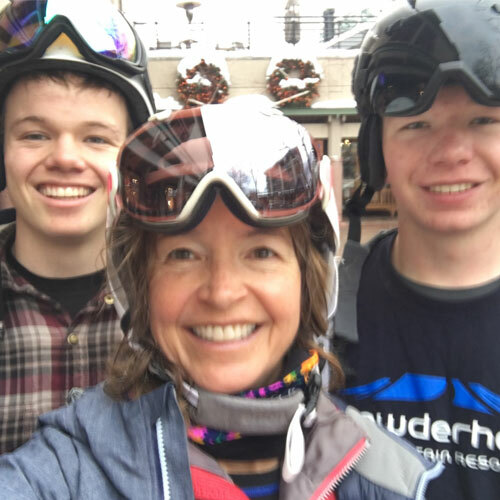 Ski Butlers was founded 15 years ago in a one-car garage in Park City, Utah and now serves over 37 North American resorts in Colorado, California, Idaho, Montana, Utah, Wyoming and British Columbia, Canada. Ski Butlers brings waxed and tuned skis to your hotel room, and, if needed, they will bring a selection of boots in various sizes along. They adjust the fit of your, or their boots, to the skis and you are ready to make turns without the hassle of traveling with skis. Ski Butlers delivered skis to Not the Mama’s to my hotel room in South Lake Tahoe and adjusted the bindings to the boots in March 2012. Photo: Martin Griff. Ski Butlers set their prices slightly under what you would pay at an on mountain rental operation and a little more than what you would pay off mountain. At the end of your stay you leave the Ski Butlers equipment at a designated spot. Don’t like the model of skis they supply? They’ll bring you a different pair. Several years ago Ski Butlers also supplied me with skis during a NASJA meeting in Lake Tahoe and I was wowed by the service. I was wowed again in Utah. As a retired guy who skis between 60 and 75 days a year and either drives or flies on Southwest Airlines (no baggage or ski equipment charges) Ski Butlers is not a financially feasible solution for much of my ski equipment needs. But for those who ski a few times a year and want to be on the latest technology, but can’t justify spending a lot of money to buy equipment for those few times, or for those who want to avoid the hassle on expense of traveling with skies, Ski Butlers is the perfect solution.